Conservatives in Canada are fond of telling a simplistic story about Prime Minister Justin Trudeau’s relationship with the press. Journalists are knee-jerk partisans, the argument goes, and their love of Trudeau’s Liberal administration is deep and uncomplicated. Accordingly, the news media is engaged in an unwavering project to praise, excuse and protect the prime minister. The Canadian media at this point is vividly hostile to Trudeau. Coverage and analysis cling to the most uncharitable interpretation of the “Lavscam” affair — essentially that the prime minister engaged in a pseudo-criminal cover-up and abused his power to protect the sinister SNC-Lavalin corporation from prosecution, then unjustly fired two heroic cabinet ministers. Headlines blare stories of a prime minister scrambling for his political life; editorial pages thunder that the scandal isn’t going away. On social media, meanwhile, journalists engage in an outrage arms race, inflating every incremental Lavscam development into an unprecedented assault on truth and justice. Pundits who express contrarian opinions get smothered in a tsunami of denunciation by the blue-check-mark set. The answer begins by conceding the obvious: There’s no such thing as a singular “press.” Social media often makes it seem as though all headlines and hot takes emanate from a common pipeline, but in practice the news media remains a diverse collection of outlets, not all of which share ideological and institutional biases. Take the distinct journalistic sub-genre “entertainment and lifestyle”. Soft media of this sort has undoubtedly been a Trudeau ally, as it’s been to other “celebrified” politicians, such as Barack Obama and Beto O’Rourke. Good looks and an intriguing biography will always make a compelling subject independent of politics. Accordingly, Vanity Fair, Rolling Stone, Vogue, Chatelaine, and Reader’s Digest have all turned their gentle lens on Trudeau at some point. The resulting profiles, sycophantic in the ways celebrity profiles often are, became major news events in their own right. Reporting on foreign nations is inevitably clouded with stereotype, metaphor and cliché. In Canada’s case, this means framing the country as a Scandinavia-like beacon of progressivism in contrast to its backward neighbour. Trudeau’s flair for showy virtue-signalling — beginning with his “because it’s 2015” quip at his inauguration — offered reliable fodder for outside journalists filling holes in pre-written scripts. As populist conservatives won power elsewhere, obsequious praise was heaped on Trudeau for his “lonely defence of liberal values”. Go back and revisit the domestic political commentary that greeted Trudeau’s meteoric ascension to the prime ministership, and you’ll be struck by two themes: extraordinary hostility to Trudeau’s Conservative predecessor, Stephen Harper, and extreme apprehension about the skills and talents of Trudeau himself. “Justin Trudeau may have the heady combination of external charisma and internal strength, but we don’t know whether he has the discipline, the knowledge, the moxie to face down the mega-ton of malice that would come his way,” wrote the Globe and Mail in 2012. 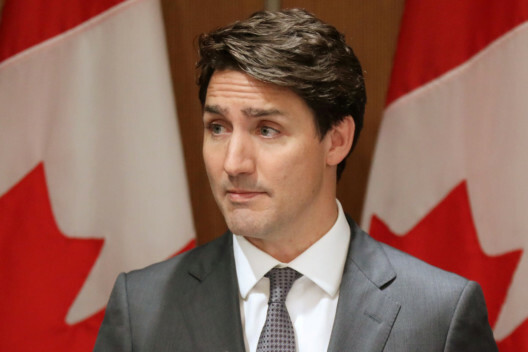 I’m not sure “even Trudeau knows why he’s running for the leadership of his father’s former party, other than that everybody expects him to”, said the Montreal Gazette. Andrew Coyne called Trudeau a man with “next to no qualifications for the job” who had “made a virtue of his opacity” and turned his party into a “personality cult”. The similarly ultra-establishment Chantal Hebert at the Toronto Star described a politician in need of “training wheels” who could “only avoid putting his foot in his mouth by sticking to banalities”. Yet, many of these same voices portrayed Harper as such a glowering, scheming, reactionary tyrant that his removal could simultaneously be regarded as a self-evident good. This was a bias in Trudeau’s favour, but not an affirmative endorsement. Few pundits may have believed he deserved to win, but they were near-unanimous that Harper deserved to lose. As the October election draws closer, it’s easy to imagine a scenario in which Canada’s mostly urban and progressive commentators ultimately conclude that whatever the prime minister’s flaws, he remains less frightening than Tory leader Andrew Scheer. Indeed, even as Trudeau enjoys a wave of bad press, Scheer’s remains arguably worse, with pundits linking him to white supremacy, religious bigotry and Islamophobia. Canada’s journalists have proved capable of being anti-Trudeau. What’s less clear is if they have the capacity to be fair to a Conservative in the moment that matters.